Salvation And Survival: When Does Health Insurance Become Unfeasible? When Does Health Insurance Become Unfeasible? I knew it was coming. Our quarterly health insurance premium is due December 1st, which means that any notice announcing an increase in premium would be arriving by mail at the end of October. And sure enough, the offending piece of correspondence presented itself yesterday. I wasn't surprised. Major media outlets like Fox News were covering the expected increases all week; touting double digits for most plans. As predicted, our premiums increased by 21% --- which follows an 18% increase last year! That means we will be paying about $666.66 per month (those numbers are certainly appropriate, aren't they?) for insurance that we barely use. I know that the cost may seem in line with what many Americans' costs are on their company plans. But, since we are self-employed and don't have the luxury of "company benefits" that share the cost, this is a huge chunk out of our monthly cash flow. And here's what's even more frustrating ... I would consider us healthy individuals. We have no serious health issues and rarely visit doctors, except for my annual mammogram -- no high blood pressure; no high cholesterol; no diabetes -- nothing except for the aches and pains that accompany aging. But even considering that, we have begun a new regimen of diet and holistic supplements to combat the inflammation that is at the heart of those discomforts. So, do my increasing health insurance premium provide any benefits for that form of health care? Of course not, nor would I expect them, too. I believe that each person should be responsible when it comes to their own health care; I think our "insurance mentality" has led to a near entitlement mindset and a gross misuse of our health care system. In fact, I would much prefer to pay out-of-pocket costs to doctors, off my health insurance plan. Have you ever asked your doctor what he would charge you for a service or procedure, if you just paid him what it is worth? You would be amazed at how much the "real price" is for services, versus the "insurance price." A friend of mine recently underwent a major surgery to solve some chronic issues she had suffered since childhood. The surgery bill was $56,000; however, the insurance company wrote off all but $18,000, and after her deductible, she only owed $1200. Can anyone explain to me how this system has gotten so out of control? But like most people, we pay for health insurance to cover the unforeseen catastrophic event, such as cancer or a major car accident; anything that would require long-term hospital costs. And we'd like to think that we have options in both cost and coverage among the various individual plans. But it appears as if the options are diminishing, while the costs are escalating. It's pretty apparent that individual plans will become so exorbitant as to be impractical, or simply disappear altogether. Every insurance consultant we've spoken to has advised us to stay off the government plans being offered through the Affordable Care Act for as long as possible. But I'm not sure how much longer we can afford to pay what is turning out to be an expensive burden. To be honest, I can't really figure out what is going on, but my instincts tell me that Big Pharma, Big Insurance, and Big Government are all reaping huge profits, while we, the captive consumer are ensnared in a trap we can't escape. We are forced to purchase health insurance under penalty of the law; we can no longer afford our "old plans", which are actually morphing into less valuable propositions; and the alternative is substandard care and inferior compensation for dollars spent. Sadly, I don't have a solution, nor do I think the powers that be are looking for one. This is just another example of our infrastructure nosediving into a downward spiral. According to the mandates of the Affordable Care Act, the states were to have Medical Exchanges in place by 2014, yet for the majority of them, nothing has been done. 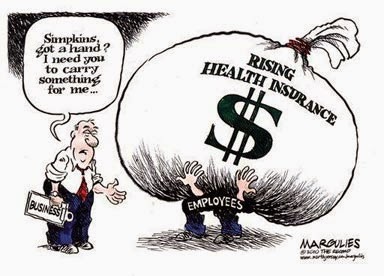 In the meantime, the premiums for private insurance plans continue to increase; more companies and corporations will shift the cost of health care to their employees; the standard of health care will go down as panels and boards decide what care you receive; and doctors themselves will find it increasingly difficult to meet new government regulations and still retain control over how they treat their patients. I know I'm not telling you anything you don't already know. You've either received a notice from your own health insurance company, or you will soon be notified by your employer that changes are coming... and none of it is good news. I'm afraid the American health care system has fallen irreparably ill, and there is no road to recovery. Take your vitamins! I received notice my insurance is canceled as it is not a compliant plan under the Affordable Health Care Act. I'm single self employed and can't even look for,a,new plan until Nov 15th. Humana, based on last years premium said I should plan on a 45% increase or $870 per month. How can I afford that. Plus I make more than the 45k so I don't qualify for help, not that I want any. This by the way is a 6,500 deductible and basically covers nothing. It is apparent by your circumstances that the "affordable" part of the ACA is not meant for us hard-working, unentitled folk... I guess they think we've enjoyed what they call "quality coverage" too long, and it's time to knock us down a notch or two --- which means substandard care, with substandard doctors, and medical boards to determine whether we "deserve" the care we need. Welcome to Dystopia in the USA! We too are independent and prefer it that way - yet this ocare fiasco is making it much more difficult. If your representatives in congress are not talking about repeal - quite honestly they are worthless in the whole deal. I don't believe any of them, they are all talk and no action. It's all on them - *EVEN* the ones who voted against it - they could have done so much up to this point but won't. Have you ever heard of Samaritan Ministries? I always thought I'd like to do that, except that my husbands company provides good insurance. Yes, I am currently checking out Samaritan Ministries and Christian Ministries health insurance. I'm hoping they can offer us a quality and affordable alternative. I will report the results in the near future on the blog. Thank you for making the suggestion! Checked into them - it's really not insurance at all - it is that members pay in an amount monthly, but you cannot have pre-existing conditions of any kind - and if people need help then you pay in as a group. A great concept - but since my wife had been diagnosed with asthma, it won't fit with us. We have done LOTS of work and study with Be In Health ministries - which finds that there is a spiritual root to pretty much all diseases - wife's asthma is now gone because of this. This is an area that greatly interests me, and my husband and I will soon be involved with training such as this with a church group that is going to begin this ministry. I will put my faith in this rather than western medicine or health insurance companies. Now just have to figure a way around the ACA!